A Dutch company called Messrs. Pels and Son built the organ in the church in 1955. They were a very reputable company at the time specialising in small neo-classical style organs. John Holmes designed the solid wax-polished, American oak case. Although, a small organ of only sixteen full stops, equating to thirteen ranks, it still packs a punch. This is mainly due to the fact that the most expansive manual, the swell, can be fully coupled to itself at both 16ft and 4ft. In total, there are nine couplers apart from the ones already mentioned including swell to great, to pedals, to swell and great to pedals, giving it a rich and luscious sound, rather than a loud sound. The pistons and other electrical gadgetry now needs an overhaul after sixty years of use. 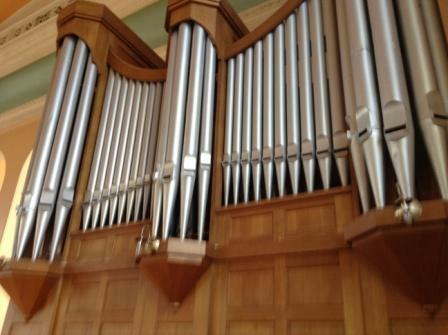 The organ is currently maintained by Meates of Dublin. It is very suitable for playing a wide range of repertoire and accompanying choirs. The dédication of the organ was given by Monsieur Jean Langlais of Saint Clothilde, Paris in 1955. Flor Peeters who was Director of Antwerp Conservatoire from 1952, said of it ‘the full organ is bold and virile in tone, the diapason is strong without being hard, the flutes have clarity and smoothness whilst the mixtures in their different compositions give the organ the necessary brilliance.’ All organists are welcome to play the organ and if interested should contact the organist. 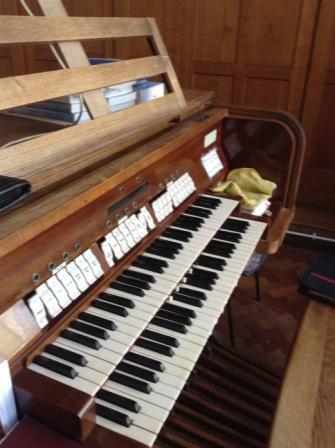 John who, although blind, was an amazing organist and friend of the aforementioned M. Langlais of Saint Clothilde. Prior to her appointment as organist in 1972, Colette played the organ for the late Canon Burke’s Boy’s Choir. Colette was an accomplished organist having studied in The Municipal School of Music (DIT) under Mr. W.S. Grieg who was Organist and Master of Choristers at St. Patrick’s Cathedral, Dublin. During her studies, she accompanied both instrumentalists and singers prior to their competitions and exams. She won many Feis Ceoil organ competitions including the Stanford Prize and Fitzgerald Trophy. Colette played at all the major liturgical events in our Church, including Papal Nuncio visits, Ordinations, Jubilee celebrations of the Church, first communions, confirmations etc., and all our Easter and Christmas ceremonies with the Adult Choir which Colette formed and trained. For many years she played at three Masses on Sundays, with the Children’s Choir and Adult Choir. At the request of the late P.P., Fr. Seán Bryne, Colette started the Ladies Club choir, some of whom sang with Adult Choir for many years. She also deputised in St. Peter’s Church, Phibsborough and Christ the King, Cabra, when time permitted. Colette played at the Ecumenical Service for the feast day of St. Cecilia held in the Rotunda Hospital Chapel, hosted by The Association of Irish Musical Societies. In 1991, Colette and the Adult Choir participated in the European City of Culture ‘Festival of Choirs in Parishes in Dublin’. In 1999 she was awarded the Benemerenti Medal by Pope John Paul II (now St. John Paul) - one of the highest papal honours in the Church, for her loyal dedication to liturgical, classical music in our parish. In January 2015, Colette died following a short illness- her music and the lady herself is sadly missed by the family, the choir members and the parishioners. Conor is currently studying organ in the DIT under teachers such as Mr. Colm Carey (Organist at the Tower of London), and currently Ms. Carole O’Connor (St Andrew’s of Westland Row). He studied piano under Ms. Fionnuala Doyle. He was pianist with the Youth Choir in the church for three years prior to his appointment as organist. He won the W.S. Grieg Cup in DIT and the Royal College of Surgeon’s Music Bursary in 2015. They sing a mix of classical and contemporary music. They sing at every 11:30am Sunday mass and at the major liturgical events of the year. The choir is led by a cantor Ms. Rachel Manning. The choir is greatly expanding at present and is always hoping for new members, both male and female, to join them. If you think you would like to join the choir, contact Conor on 0852839660. Rachel has a BA in music from the Conservatory of Music, DIT and is currently continuing her vocal training as a classical mezzo-soprano there under Ms. Jennifer Hammilton. She was a multiple prizewinner of the Arklow Music Festival in 2013. She spent four summers as the Cantor on the holy pilgrimage island of Lough Derg, Co. Donegal. Rachel has performed at many weddings and in many concerts throughout her years as a musician. The youth choir is a group for choir members from both primary and secondary school. They sing contemporary sacred music and are usually accompanied by piano and guitar. They sing at 6:30pm mass on Saturday and some major liturgical events during the year. It is conducted by Ms. Jane Barry. To join, contact the parish office. There is accompanied congregational singing with support of a keyboardist at 9:30am mass on Sundays. Check the noticeboards and church newsletter. Over the past few years some parishoners have been trained to work with the priests at the time of bereavement. This is a welcome development. 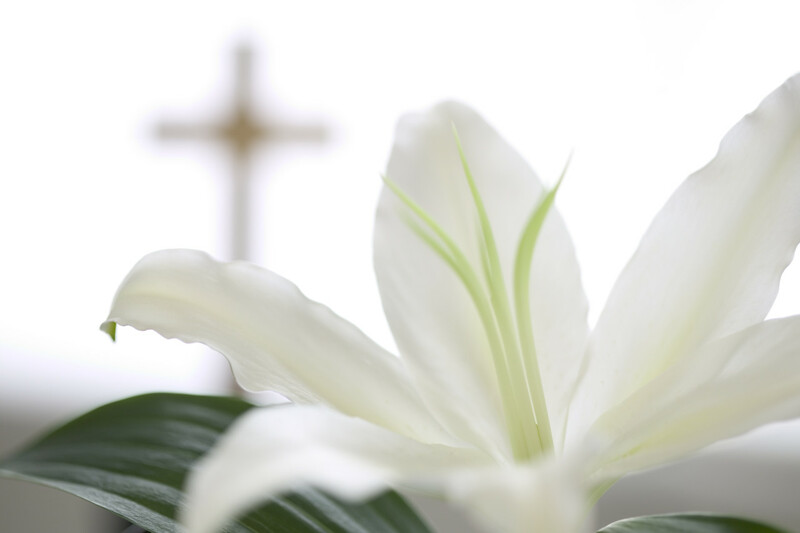 They are there to give support to the family, help with the liturgy at the reception of the body and also, to be of assistance at the funeral mass; and if necessary, leading the family in the prayers at the graveside or in the cremetorium. We as lay people are called by God through the Church to proclaim the Good News of Jesus Christ. The reader in any liturgical celebration proclaims the Word of God. The reader's task is to proclaim those parts of the Word of God which make way for the Gospel, prepare for it and set the scene so that the Gospel can be heard and take root in the hearts of the community. In practical terms the reader must prepare well to ensure that the Word is heard, understood and appreciated. Ministers of the Word are the instrument of the personal dialogue between God and His people. Lay people are called by God to assist in the distribution of Holy Communion at all the masses in the Parish. In addition, they also bring Holy Communion to those who are sick and housebound. Some ministers from "The Church of the Most Precious Blood" distribute Holy Communion to the parish each week. The Eucharistic ministry works on a rota basis. Training and support is given for these important ministries. There is also the occasional meeting/gathering, time to pray together and be renewed in our ministry. If interested please contact the parish office on 8384418.